Right folks, we’re going to do a little bit of time travelling back to September if that’s ok and to a very memorable trip to NIAGRA FALLS! Again, I got to go on this excursion on one of the International Office’s organised trips. So, a very noisy and excitable group of 100+ exchange students made their way to Niagra Falls for the day. The whole trip reminded me of a school trip, felt very nostalgic. Niagra is about 4.5 hours south of Kingston, down through Toronto and out onto the other side. Driving along the highway(motorway) we got to see the diverse housing that is in Canada. Houses are very different to Britain – they tend to be wooden-cladded on the outside and with a huge front porch and each house seems to have its own character and individuality. Also along the way we passed many peach tree fields (yum – and full of peaches) and grapevines. 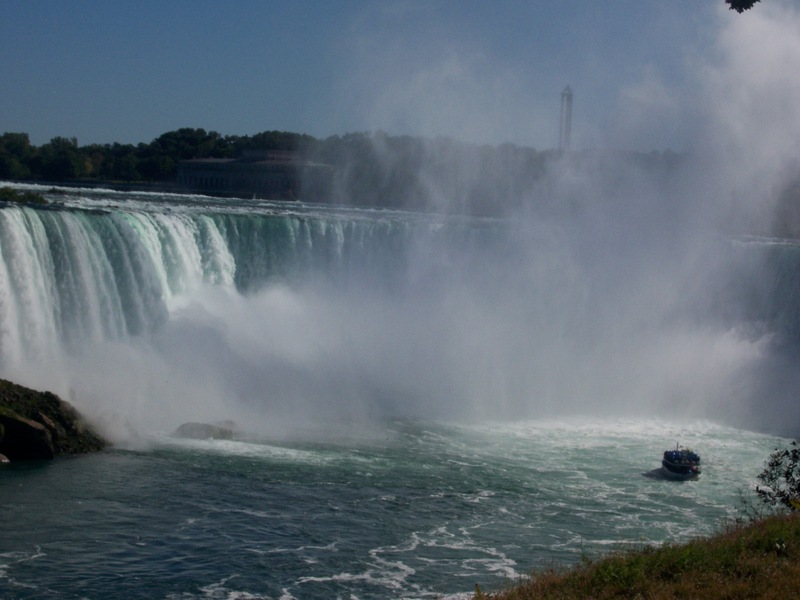 I don’t know about you, but I had a very romaticized vision of Niagra Falls and the surrounding area. I expected the falls to just appear out of the middle of nowhere – almost a mirage in the Canadian outback but oh no, nope, na-da, not at all. Instead of entering the wilderness and countryside we were transported into Blackpool or Skegness meets ‘I’m trying to be Las Vegas but I’m more like his cheap, down-market distant relation that no-one mentions’ , in more simpler terms we entered the realm of neon, plastic and tacky-ville, also known as Niagra city. Beautiful right?! 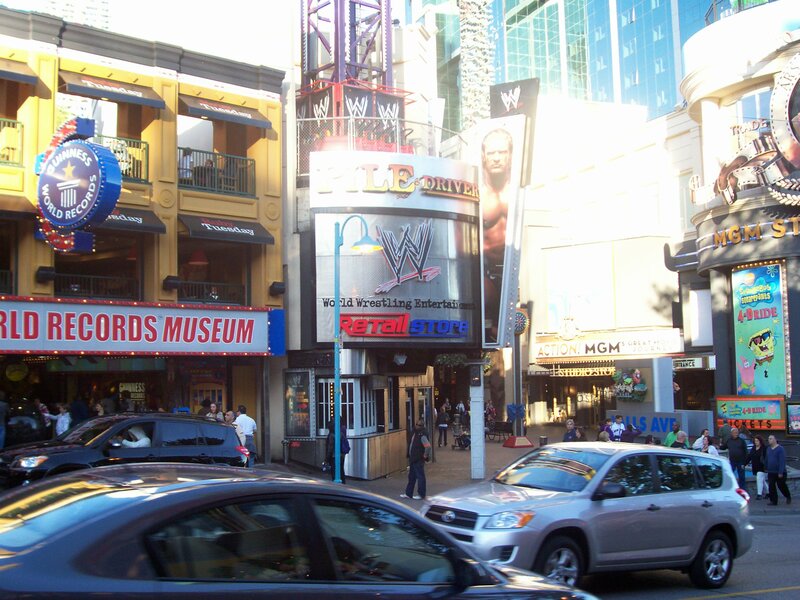 Or what I would like to refer to as “The Beast” – loud, proud, brashy, full of fast food restaurants, arcades and horror attractions. Quite a sight and the sound was something too – booming music, canned laughter, blood-curdling screams all mixed with wafts of butter popcorn and burgers. Anyway – moving to the “The Beauty” section, nope, disappointingly not my fellow international students but the Falls themselves. The complete extreme of the town which is jus literally teetering over the sides of the falls. I now think maybe it was a ploy on the part of the council to make the Falls appear more dramatic and naturally beautiful. 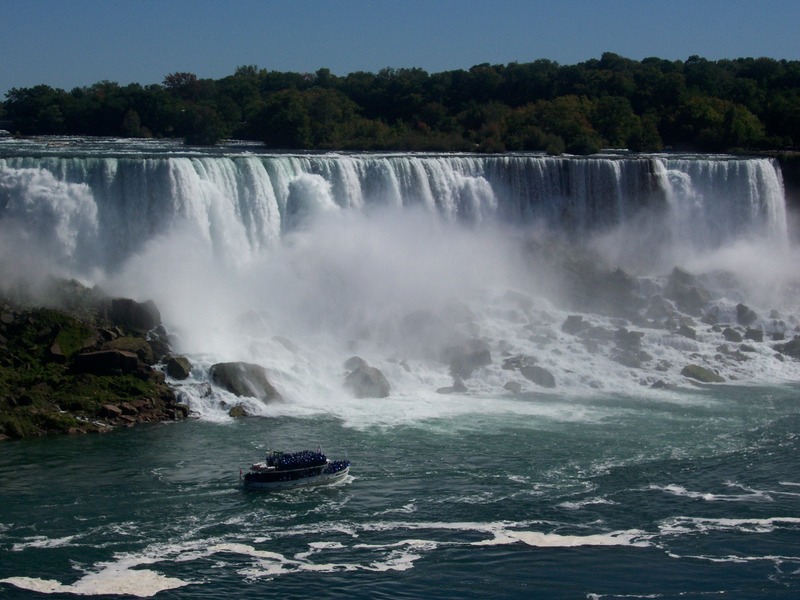 Us Exchange students swarmed off the coach like ants and made our way to view the Falls (i.e. just head in the direction of the loud, roaring noise). I didn’t realise that there are actually two Falls, one on the American side and the other the Canadian. In the left hand corner for the Americans we have the aptly titled ‘American Falls’ and in the right-corner we have battling it out for Canada, the one, the only, ‘Horsehoe Falls’ (so named because of the shape and not as egotistical as the Americans. Can you tell the Canadian/American rivalry has started to rub off on me?!) As you might have guessed there is much controversy and debate over which side, Ontario or Buffalo, New York is the most stunning. Hands down the Canadian – no bias, honest. 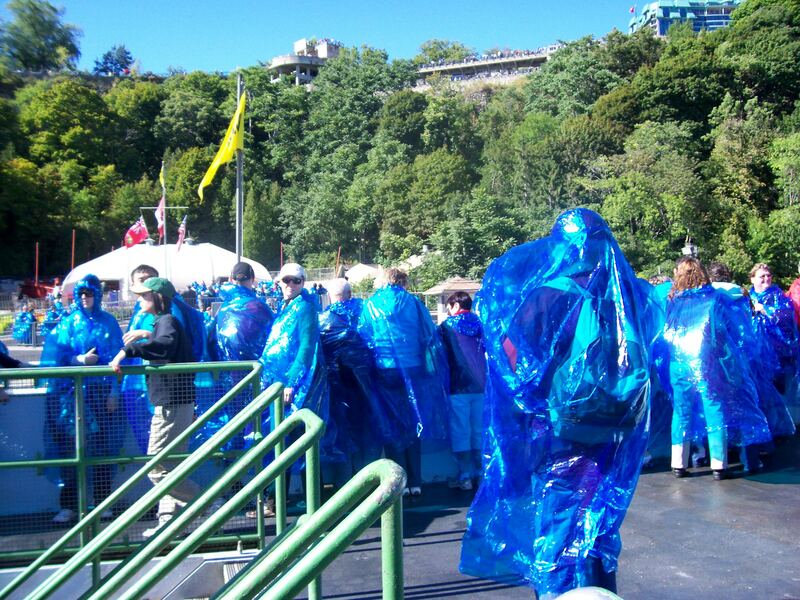 A group of us went on the “Maid of the Mist”, a boat ride that gives you a close-up and very wet experience of the Falls. 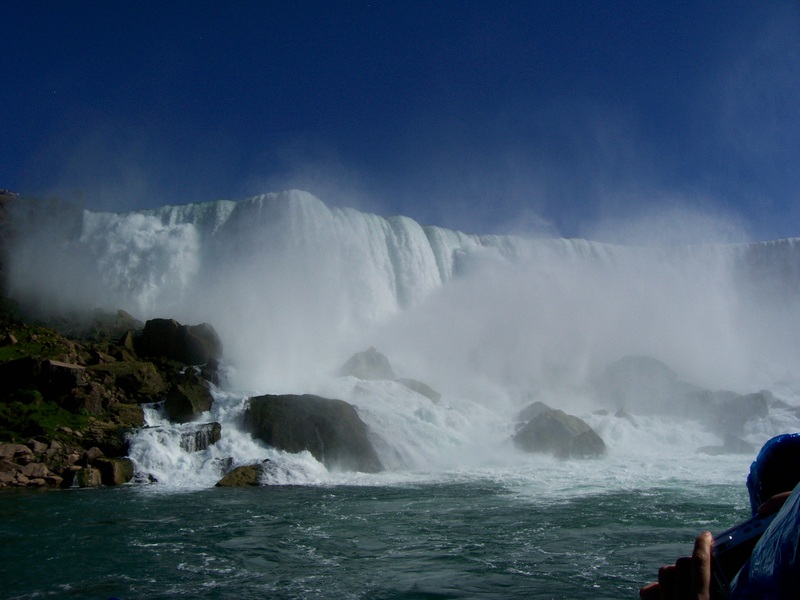 You get to go right to the base of the Falls and fully appreciate their force and roar. Before getting on the boat we were given a blue, transparent mac, but I never expected to get anywhere near as wet as I did. For part of the trip it was like standing in the shower with your clothes on, completely absurd but then you also couldn’t see anything apart from spray and mist when we got close to the Falls. People squealed like mad, was very funny. 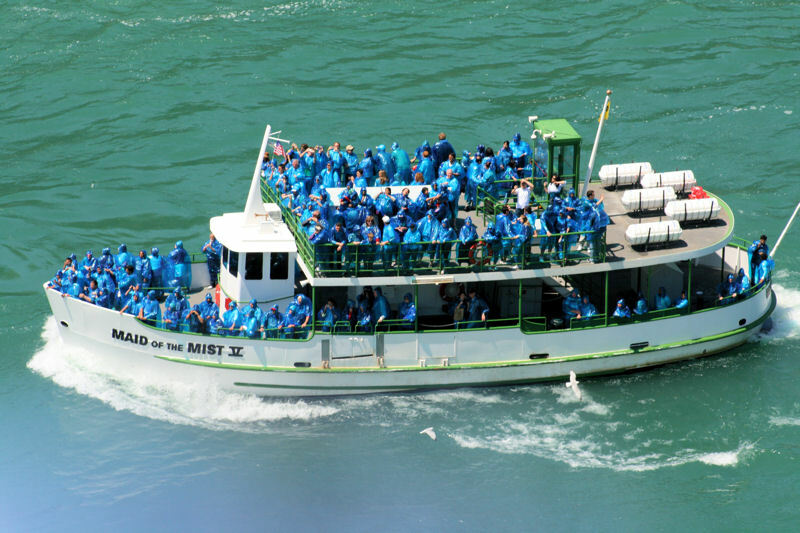 The boat trip was the highight of the day and a must if you ever get the chance to go to Niagra. 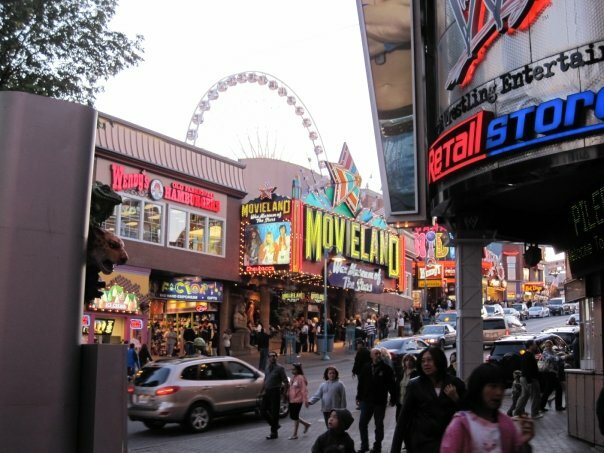 After viewing the Falls, taking in the sites and walking round the parkland that borders the Falls, we headed back into the city for the evening and found our way to a casino. I’ve lived a sheltered life, so I’d never stepped foot in a casino before and with trepidation entered what I assumed would be a luxurious palace of vice, sin, money, wealthy- well dressed people wearing ball-gowns (I’ve been watching too much James Bond, I think). The reality was somewhat different – lovely patterned carpet like your gran would have, actually, on second-thoughts, my gran wouldn’t’; it was too florally and patterned. Garish lighting, with row after row after row after row of slot machines, what?! And who was sitting at them – handsome well-dressed people, nope very everyday looking Mr and Mrs Canada and surprisingly very few younger people in sight. Through the labyrinth of man-mad money-taking machines we made our way out to the other side and faced the sea of what I think were blackjack tables and other card games. Again, all my illusions were shattered. But I hear you cry, ‘did you have a go then?’, ‘How much did you win?’ Well, my friends (or I mean, my one Canadian-Polish reader, you know who you are!) 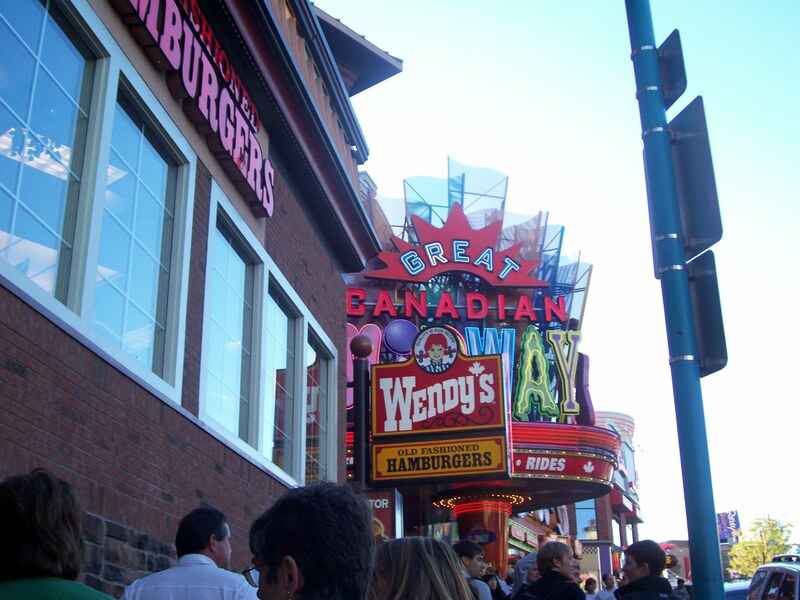 I was meek and mild along with all my exchange companions, call us skin-flints but we firmly kept our money in our pockets, we had better ideas of putting the loonies towards a cheap burger from the neon city! So there, ended my soiree into the world of what I expected to be Casino-Royale but actually turned out to be Mecca Bingo. Ahhh, the reckless, high life of a student. But back to the Falls, they were fantastic to see and left me hard of hearing on the coach on the way back, the rumbling of the falls was almost beaten in decimal levels by the snoring going on. There were also many students bedecked in their finest ‘I’ve been to Niagra Falls’ t.shirts and baseball caps!